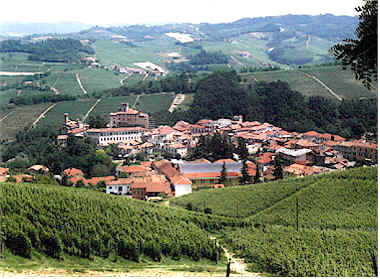 Looking South-East...the town is Barolo. Vineyards of Castiglione Falletto and Monforte d'Alba are in the distance. The vintage of 1997 was proclaimed a "Vintage of The Century" very early on, as wine writers raced to be the first to trumpet the praises. More than one Barolo producer has expressed a preference for the 1996 vintage, but they're delighted to have so much hype surrounding the 1997s. Well, is it "hype" or is 1997 an exceptional vintage? From a pricing stand-point, there is a lot of hype! A number of American importers see this as a license to increase prices to dizzying levels. From a winemaking standpoint, the vintage presented Nebbiolo grapes in a very healthy state. Some might say the wine are a shade lower in acidity than might be ideal, but the intensity of fruit is most unusual. While the wines have tannin requiring cellar time to smooth, the acidity might not be sufficient to preserve the fruit for an equal amount of time. Nevertheless, this is a lovely vintage. Winemakers who failed to do a good job should look for other lines of employment. Two wines tied for first place. Third place was just 4 points behind first and 4th place was only 8 out of first. Three wines were within three points at the "bottom of the heap." This proved to be a difficult tasting, the wines all being of above-average to exceptional. 8th Place: LUCIANO SANDRONE "Cannubi Boschis"
Only 2 tasters out of 16 had this famous wine ranked in their "upper division" (first, second, third or fourth places). One person described it as being "reminiscent of Cabernet Franc...also slightly metallic notes permeated this wine." Another detractor found "Brettanomyces, wet leather and some sweet tobacco." 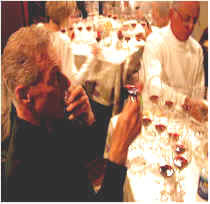 Another critic said "The nose was really good, but there's nothing on the palate." On a more positive scale, one person found "chocolate, plums, cherries and some earthy undertones." Another described it as "raspberry-like." Bob's take on Sandrone: "The wine is bright showing berries, chocolate & vanilla from the oak. Quite a nose-full! Opening up it shows sweet herbs. But the oak a bit much now. Woooah! Here's a big, concentrated mouthful, long, "just right" tannins, ripe (trace heat); a California palate pleaser. But the center weakens now." I found the fragrance to be very enticing, reminiscent of sweet cherries with a touch of vanilla and vanilla cream. Very attractive and decidedly different from the rest. The same cherry notes shine brightly on the palate and the wine has round, sweet tannins. I can see drinking this in the next few years. One-and-a-half stars (3 star scale, zero being average or standard quality). 7th Place: BRUNO GIACOSA "Falletto di Serralunga d'Alba"
An "old school" winemaker, Giacosa's wines were a reference point in the 1960s and 1970s before Angelo Gaja changed the landscape of the Langhe. His wines remain rather traditionally-styled. One critic panned this for its "medicine-like, metallic, cherry candy fruit." Another judged it as being a "middle-of-the-road Barolo." Someone else added "It's darned tannic." One fellow found it "acidity with a carbolic fragrance." Another taster described it as being "slightly oxidized with muted black cherry fruit..." and they assessed it as "not bad." Someone else echoed these sentiments, finding it to have "muted fruit...flat and uninteresting." Bob said "Cola nut, spice, restrained French oak, cherries (could this be Pinot?!) A rock candy edge cloys a bit as the wine opens in the glass. Berries on the palate, appropriate tannins with the fruit hanging in nicely." I wrote "Molto tipico!" in describing the berryish fruit which seems to show the start of evolving into that "tarry" character which often is a hallmark of Barolo. This is less fruity and less charming on the palate, traits typical of Signor Giacosa's wines. One-and-a-half stars. 6th Place: CLERICO "Ciabot Mentin Ginestra"
This esteemed wine's scores were all over the map. One critic said they "liked the sweet oak and perfumey undercurrent," but this then veered off showing a "rubber glove fragrance and was shrill, lean, tart and sour" on the palate. Another taster likened it to "lighter fluid...it's volatile and sharp." Someone else described this as showing "sweet oak and a bit of wet tobacco." Another found "nice fruit." One person felt it has a "really long aftertaste, but it's slightly bitter," while another critic described it as "leathery." Bob describes this as having "Cherry, mint, angelica root, oak, mocha...! The characteristic wild element of Barolo up now; forest underbrush; complex! Nice "cherry pie" fruit and acidity on the palate. Curiously, not showing much complexity here but should develop well. It needs time (10yrs) to resolve the mouth coating tannins." I found it quite intense on the nose, showing lots of berries and a bit of heat from the alcohol. A light bit of oak adds a note of complexity. I felt it was a bit more reminiscent of some 1996 Barolo wines on the palate, being very structured and rather tannic. It's big and aggressive in the mouth and needs much patience for it to smooth and blossom. Eight to fifteen years of aging are warranted here. One-and-a-half to two stars. Another wine that polarized the tasters, one person described this as having a note of "barnyard and somewhat Burgundian-styled." Another said it had some "toasty oak and a coconut, vanillin note that is quite different from the rest." Someone else described it as being "French wine." One fellow said it was rather "floral, with hints of the perfume of a face powder." One critic said it had "Zero aroma at first and it tasted flat, but improved with aeration." Another found "herbal fruit, some oak and nice concentration and wonderful depth...it's big and rich." This was also described as having "a smoked meat note with cherries and vanilla...very drinkable!" Bob's notes on the Vietti Brunate: Bright, estery, and a nice bit of leather with cherries, cherry gumdrop and mocha. But the nose closes down a bit. On the palate the wine shows the Pinot side of Nebbiolo. Theres a nice assist from oak; long, quite deep but tannin covers fruit now, showing some weakness." I was bothered by the initial fragrance which reminded me of the oxidative notes of a Fino Sherry. I found a berryish fruit quality underneath, but didn't care for the fragrance as much. On the palate this wine had a very rich texture and I found it more pleasing in the mouth than on the nose. Though I ranked it last, I still gave it one-and-a-half stars. One taster described this as being "The Caymus Special Selection Cabernet of Barolo...it's got lots of oak and is intensely barnyardy...a very powerful wine." Someone else found it to be "peppery" and it "had the best finish." Another person liked its "smooth finish." Someone else said it had "green notes...coffee, a bit of volatile acidity, but that blew off...it's nice." Someone else described the fragrance as being reminiscent of "shellac." Another person found "sweet oak, violets and truffles." One taster said it has "heavy tannins and heavy oak." Bob described the Pira as " 'Pretty' Nebbiolo fruit (more Langhe Rosso than Barolo). Theres a raw, pickle barrel oak component (American oak?). Opening, it shows cherry gumdrop, mint and mocha. Its one big tough mouthful of super oaked-up Nebbiolo; ripe but center falls out of the fruit. Nice but..."
I found a lot of berry notes to go along with the sweet oak bouquet. I also found a hint of anise to the fragrance...one of the most complex of the bunch. In the mouth it's nicely built. Good fruit with a nice bit of tannin. Despite the lavish oak treatment, there's plenty of fruit here. I gave it three stars for the fragrance, but one-and-a-half for the palate at this point, so my final assessment at this stage would be a two-star+ rating. Two Conternos and one Fantino team up to produce about 150,000 bottles annually at this Monforte d'Alba winery. The first person to assess this said it's "Big, intense, fruity, a bit hot and somewhat plummy on the nose." Another taster liked its "great finish." Someone else described the fragrance as being reminiscent of "violets." One critic felt it "had too much tannin" and this sentiment was echoed by another fellow who said it had a "nuance of amaro and it's a very hostile wine." 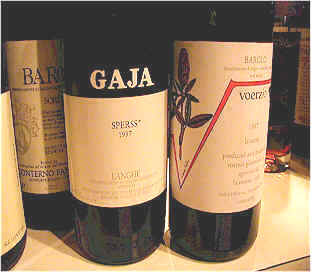 Bob wrote "Spice, cherries, Nebbiolo fruit up front; dust, Barolo terroir. This is a "fruit dominated" Barolo; a bit of oak does show now with sweet herbs and more spice. The wine has excellent tannic grip and some very deep Nebbiolo fruit; Pinot-like, long; this wine has the stuff!" My first sniffs encountered a hint of a plastic or Band-aid note. This either blew off or I became desensitized to it, noting more berry-like fragrances with aeration and some woodsy notes. The flavor is excellent, having a velvety, rich texture with some abrasive, sandpaper-like tannins. This is really complex and deep on the palate. Needing 8-15 years of cellaring, I gave this a two star rating. The first person to offer an opinion found this "smoky and toasty with a smoky finish." Another said it is "long and interesting on the finish, complex with heavy tannins. Fantastic!" A third person found it "dry and astringent." Someone else found "Brettanomyces with an earthy and wet earth note." Someone else found it "earthy, tarry and big with some woodsy flavors." One enologist said it "has a serious dose of Brettanomyces and I hope this was filtered." Another person found lots of "berries on the nose and it's quite full-bodied." Bob's notes: "Deep Nebbiolo fruit with a nice accent of oak (more spice than vanilla); crme brle, cherries, sweet herbs, cocoa. Theres a trace of Brettanomyces leather up now. The nose is remarkably complex. The wine is tight on the palate with some tough tannins and deep, concentrated fruit; long. Give it a minimum of 10yrs!" 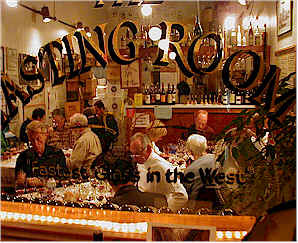 I am usually sensitive to Brettanomyces, a wild yeast that causes a fragrance reminiscent of wet earth, leather and meat. Instead I found good fruit, with a berry note and some cedary fragrances. I gave it two stars for the nose, but three for the flavors: big, ripe fruit, nicely oaked...berries. It's quite a substantial wine on the palate. I pegged it as needing 5-10 years to soften a bit. Two stars+. This small producer in La Morra has fared well in our recent tastings, this time finishing in first place! Gianni and Franca Voerzio produce about 60,000 bottles annually. One taster described this as a "Turley-styled wine; it's high in alcohol, almost Port-like with a lovely nose." Someone else found it "high in acidity with a tart berry character." Another taster found it to be rather "viscous in texture" and wondered if this has a hint of residual sugar. They added it's got a lot of "sweet oak, dark fruit, a hint of mint and black cherry." One person found it to show a note reminding them of "brine...it's salty and seaweedy with a mushroom note." Someone else found "raspberries and vanilla." Bob's notes on Signor Voerzio's wine: "Cherry side of Nebbiolo with a rich oak veneer. A "user friendly" nose with herbs and spice. The Barolo sauvage element peeps through with some berries now. The wine is tight but has a fairly easy grip and a citrus rind edge; lots of stuff, length and concentration. Give it at least 10 years." I thought the nose was quite distinctive, showing anise, blackberries, cedar and oak...very complex. The same features shine brightly on the palate, with fairly big tannins and reasonably good acidity. It needs 8-15 years and merits a two star+ rating. Very fine.